"The BPA Guide offers a simple methodology to elicit, document, and analyse the existing “as-is” business processes involved in international trade, as well as aid in developing recommendations for further improvement. It suggests a set of practical steps and activities, from setting the scope of the business process analysis project; planning its implementation; collecting relevant data; and presenting it in an easily understandable manner, to analysing the captured data in order to identify bottlenecks and developing recommendations for improvement. To demonstrate the practicalities of the BPA Guide, a step-by-step approach on how to elicit, document, and analyse the existing “as-is” business processes involved in international trade is presented. Based on the results, recommendations for further improvement are developed under consideration of existing conventions defined in the Guide. The BPA Guide intends to serve practitioners and policymakers from government agencies or the private sector involved in: the harmonization and simplification of international trade procedures; the harmonization of related data requirements with the international standard; and the implementation of Single Window. From the BPA Guide, practitioners will learn a step-by-step approach to business process analysis and the development of recommendations for future improvement. Policymakers, on the other hand, will benefit from a better understanding of the linkage between business process analysis and trade facilitation measures, including business process simplification, data harmonization, and Single Window implementation. They will become acquainted with prerequisite steps that have to be taken prior to the implementation of trade facilitation measures." 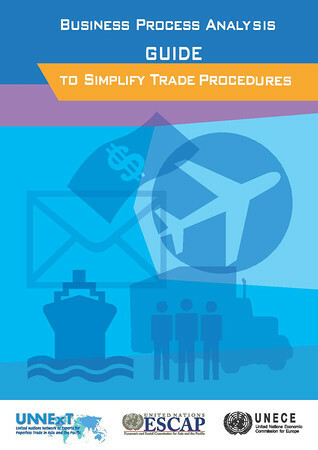 The Guide to Business Process Analysis to Simplify Trade Procedures is also available in: Russian: https://unnext.unescap.org/content/guide-business-process-analysis-simpl... and Arabic: https://unnext.unescap.org/sites/default/files/BPA%20Arabic%20Version.pdf.